First published January 25, 2019 , last updated April 8, 2019 . Reading time: 9 minutes. Sometimes that warm jet of air is the only part of the morning routine where we get to feel some warmth up against us and still hold on to that cozy bed feeling. Whether or not this happens to you too, we all agree that hair dryers are an important piece in our daily routine. Heat styling tools can damage your hair, so you really need a good hair dryer that walks that fine line between affordable and being the least damaging. Thankfully, we have curated a selection of the best affordable hair dryers that will ensure you won’t get damp, frizzy, damaged hair or break the bank. Keep reading to see our suggestions! This affordable choice not only is lightweight and stylish, but also packs a punch. 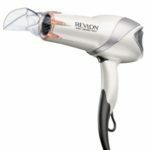 Revlon 1875W includes concentrator and diffuser attachments, making it perfect for those who have thicker and more textured hair. It also has infrared heat technology and tourmaline ionic technology, which improves the shine of your hair and control frizz. It also does less damage to your hair as it incorporates several ceramic coatings. It’s great for all hair types, and has two heat settings, as well as a cooling setting. For a few extra bucks, you can also acquire it with some sectioning hair clips, which is perfect if you have very thick hair that takes a lot to dry, and if you like doing hairstyles with the help of your dryer or other heat tools. Overall, this is the best bang for your buck and it is a purchase you won’t regret! Would you like to have the full benefits of a salon-style hairdresser at home without having to spend a lot of money? Folks, let us introduce you to the NITION Negative Ions Ceramic Hair Dryer. So, negative Ions are a new technology that minimizes frizz, keep your hair shiny and smooth, and provide a host of benefits to your hair while preventing damage and ensuring a fast try. This hair dryer is very light and has three heat settings and two wind speeds, as well as a cool shot button. It comes with two attachments, a diffuser, and a concentrator, that caters to every hair type without slacking on effectiveness or quickness. It is also easy to store due to its hanging ring, and has a long cord for all your “mirror is too far away from my outlet” needs. Other than the negative ions, this hair dryer also has a ceramic coated air outlet grill that is infused with nanosilver, argan oil, and tourmaline, which provides many benefits to your hair. The company also offers a two-year warranty and has a 90-day exchange policy in case you need to exchange it. If you want great benefits for your hair but don’t want to break the bank, this is the solution for you. Don’t forget to make sure you’re using an appropriate brush to get the most benefits of this beauty. 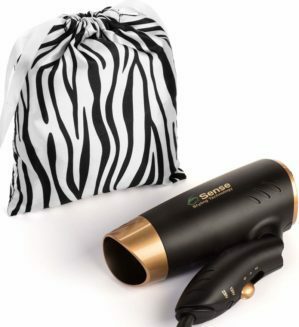 This option is for those of you who travel a lot and want a practical and lightweight hair dryer for your carry-on bag. And it is also very helpful if you don’t have a lot of storage space and need something that just tucks in somewhere. Another great feature of this tiny yet powerful object is that it works in countries with different voltages, and is also very lightweight. Not to mention it also comes with a zebra-print tote to pack it while traveling. Overall, it’s a practical little friend for life on the go – and who doesn’t need one of those nowadays? TIGI, the owner and producer of Bed Head, and Bed Head itself are some of our favorite hair care brands. If you have very thin, flat hair, you know the struggle of trying to get a good volume that doesn’t look like a frizzy mess. However, if your hair is curly skip this one, as it is more focused on providing volume and shine to thin hair without frizzing. Besides, it comes with a concentrator attachment to ensure your hair dries quickly, and two-heat and two-speed settings, including a cold shot button. It also has a ring so you can hang it and access it very quickly and with ease. This one has a volume control ion dial that allows you to customize those settings, and the long cord ensures that you will never be too far away from the mirror to use it. Ultimately, this is the tool for you if you love fun, bright colors, have thin hair in need of some boost, and aren’t afraid to spend just a little bit more. This travel-friendly solution is perfect if you don’t have a lot of room in your carry-on and know you are either going to lose or eventually damage your hair dryer (We’ve all been there. It’s okay, you don’t have to explain or justify it, traveling is just messy). 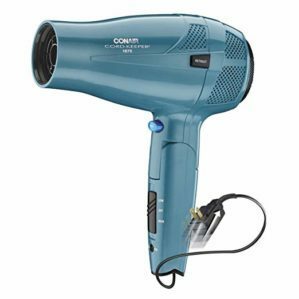 Conair Hair Dryer folds and has a retractable cord so you won’t have to wrap it around your dryer and lose precious space for other important items. Although this might be a cheap tool, don’t let that price fool you – it minimizes the damage made to your hair, and keep it frizz free. That way you won’t have to wear a hat in all the cool pictures you want to take! What’s more, it also has two heat and speed settings, as well as the cool shot so you can ensure your hair will have all it needs to be taken care of. The hair dryer doesn’t come with any attachments, though. If you have more textured or curly hair this won’t have as many benefits for you, but if you just want to dry your hair a bit and skip on the styling, then you should still consider it. Messy or tidy, if you love traveling and are a minimal person, this is definitely for you. 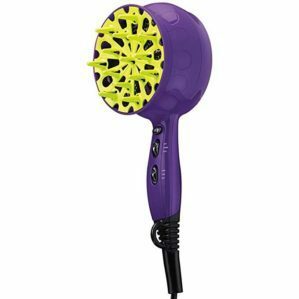 If your hair is curly or textured and you are sick and tired of buying attachments for bulky hair dryers, fret not, for we have found a solution for you. 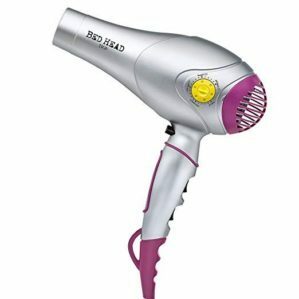 Bed Head hair dryer is great for those of you with curly hair want to give your hair a bouncy, shiny finish while keeping the frizz in check. The brightly colored model can be used with or without the diffuser attachment. So you can choose if you want to just generally dry your hair, or work your curls. The fact that it can be used as a regular hair dryer is also a plus. Being flatter than regular hair dryers also means that it’s easy to store, and includes a ring so you can hang it and reach it nearby. It has tourmaline in it to keep your frizz in check and enhance the natural volume of your hair. 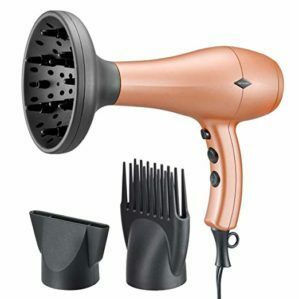 Besides, it also features three heat settings and two-speed settings, as well as a cool shot button so you can quickly dry and style your hair as you wish. If you love your natural curls and want something that will enhance them beautifully without breaking the bank, then look no further! 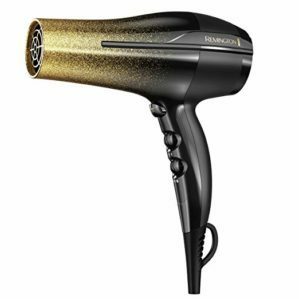 Remington is well known in the appliances world for their quality and affordability, and this hair dryer is not an exception. Besides this one also features ionic and ceramic technology and promises total frizz control. This gorgeous looking dryer is very affordable and includes several attachments that serve all hair types, including a hanger ring for easy storage. The hair dryer offers three heat settings and two-speed settings, plus the cool shot air, making for a quick dry even for the thickest hair. This one couldn’t be out of our selection of the best affordable hair dryers: if you want a cheap, but still good quality hair dyer, then look no further. Those are the best affordable hair dryers we picked for you! So, we hope that no matter the pick these will give your hair the love it so deserves. Check out other reviews and pick the one you like the most. Really, it’s crucial that you get one appropriate for your hair type because hair dryers should last a long time if you take proper care of them. Since you’ll put your hair under some stress… do not forget to check our coconut oil suggestions to make sure your hair is as shiny as it can be. Are you thinking of getting any of these or are you happy with your current model? Let us know in the comments!